Over the years, I have seen several numerology programs, and the ones created by Hans Decoz are the most comprehensive and valuable. Although I studied numerology onIy for a short time, and have not integrated it into my astrology practice, I have a deep respect for it. 1. Profiles & Forecasts. This module creates an in-depth analysis of a person's numerology, over 50 pages, with well-written delineations for all of the major and minor numerological factors such as your Expression and Minor Expression numbers, your Cornerstone, the four Planes of Expression, your four Challenges and Pinnacles, and many many more. It also includes your Physical, Mental, and Spiritual Transits for several years, and also delineations for several of your Personal Years, Months, and Days. I feel like calling this incredibly comprehensive report, "Everything you wanted to know about your numerology." 2. Relationship Compatibility. This program analyzes a couple's compatibility using major numerology factors like Life Path, Expression number, etc. 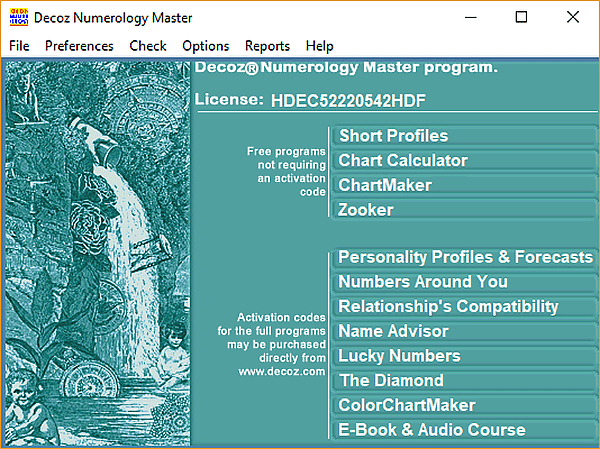 As such, I have found it to be the most accurate and profound numerology relationship software I have ever seen, by far. My highest praise! 3. The Numbers Around You. Here you can look at the effects of your street name and number and your telephone number, and even find lost objects. I find this to be a very interesting and surprising use of numerology. 4. Name Advisor. With this function, you can enter several possible names and the software analyzes the internal compatibility within each name. I found the results of this module very fascinating and accurate, and very functional. 5. Lucky Numbers. Since I don't gamble or play the lottery often, I'm not able to evaluate the effectiveness of this feature, but it provides luck life numbers, year numbers, month numbers, and optionally lucky numbers for each day. 6. The Diamond. This is apparently an ancient technique lost for years and recently revived by the author. While the report is well done, I didn't relate to the contents of it (which is oriented to the present year). 7. Color Chart Maker. 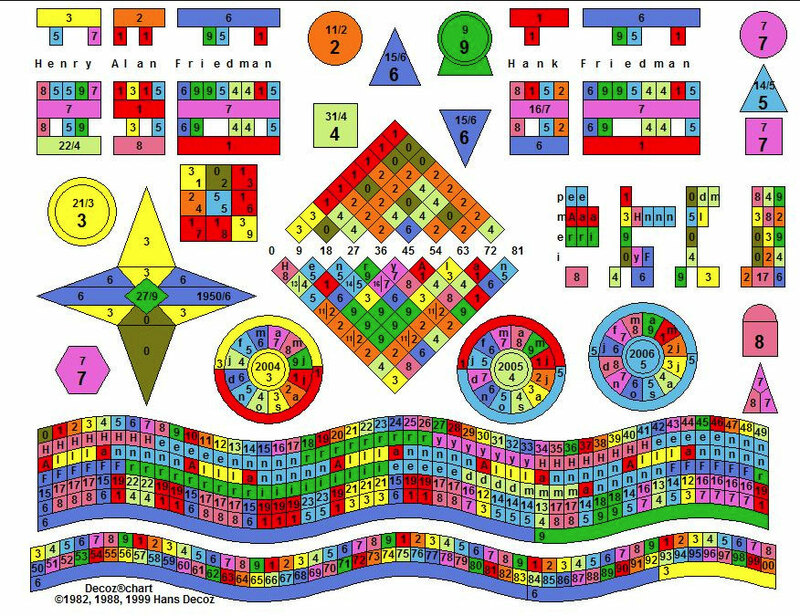 I have never seen a more comprehensive or colorful numerology chart in my life. Packed with information beautifully arranged (click here to see a sample), the program also offers a separate legend page describing each of the elements of the page. Very well done.! Hans Decoz has created an awesome array of great numerology programs. I am thankful to him that such excellent numerology tools exist. Just a note to let you know that several months ago, I purchased the professional version of your numerology software, along with the course. I love what you did with the program. Awesome numerology software and reports, I never used to believe in any of the "ology's" but this report was too accurate to deny. Thanks! Many thanks for your help. I truly have appreciated your numerology courses and your personal touch with your clients. Many happy days for you and yours. I eagerly await your email of the activation code as I have found the free numerology reports very good and can only anticipate that the full programme will be as enlightening .